General elections are held every five years. It is the only opportunity given to us as South African citizens to vote for the political parties and leaders of our choice. The Independent Electoral Commission (IEC) is a body that government has charged with running the elections. 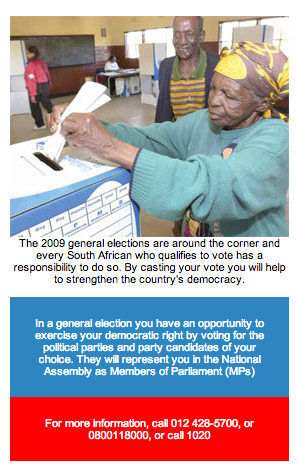 South Africans who are not registered as voters and missed the voter registration campaign earlier this month, can do so during the voter registration drive in February 2009. You can also use this period to make changes to your personal details or residential addresses. If you are not sure whether you are registered, it is easy to find out whether your name is on the voter's roll. Just SMS your ID number to 32810. The IEC has found that younger people are less interested in voting. For this reason, there is a plan to run campaigns at universities and colleges, as well as in communities, to encourage the youth to register as voters before the elections. give a physical address where you stay. In a general election, you will have the chance to exercise your democratic right by voting for the political parties and party candidates of your choice. They will represent you in the National Assembly as Members of Parliament (MP). These MPs then elect the president of the country. In turn, the president of the country appoints his or her cabinet ministers, mainly from among the MPs. You will also be voting for a political party and party candidates of your choice for leadership positions in provincial governments. They are called Members of the Provincial Legislature (MPLs). The MPLs elect the premier of the province. The premier, in turn, appoints Members of the Executive Council (MECs) from among the members of the provincial legislature.